Orioshuttle is the last experience by Autoservizi Locatelli Srl and Airpullman Spa. 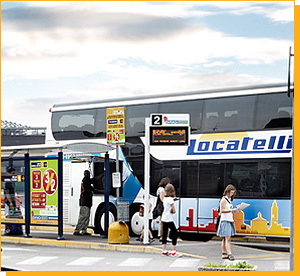 The bus service is active from 2005 in Orio al Serio Airport in order to connect the airport and Milan city in its three important locations: Central Station, Rho Fair and Malpensa Airport. Three comfortable, fast and not expensive lines that take passengers directly to Milan - without stops during the trip - from Monday to Sunday. Bus leaving from Bergamo down town (via Furietti 17) to Malpensa Airport, with intermediary stop in Orio al Serio Airport and Monza down town. 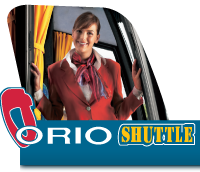 Orioshuttle assists passengers in box office in Orio al Serio Airport (at the Arrival), in authorized ticket office in Milan Central Station or Malpensa and directly at the bus stops, where bus drivers and Orioshuttle staff are daily at your disposal. Thanks to web site, Whatsapp, Facebook and Instagram fan page up-to-date in real time, Orioshuttle team can answer to all demands and passengers can buy special price tickets with our booking online system. You can show online ticket by smartphone/tablet.